Dr. Steven Chang is a Monterey dentist with state of the art technology including digital x-rays, laser dentistry, Air Abrasion, Intra Oral Illumination & more. Learn more about some of the advanced dental technology found at our Monterey dental office. Fast and minimal exposure is the key to the new digital x-ray. Exposure to x-ray is 10-20 percent of the normal exposure that is used in a regular traditional x-ray. 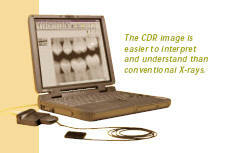 Ability to use the computer enhanced imaging of the digital picture allows for more optimum diagnostic care. Highly innovative, extraordinary addition dental lasers. As the industry’s best-engineered and most reliable fiber-delivered laser, the VersaWave features higher repetition rates, higher power output, and exceptional delivery ergonomics. As a result, patients experience fast, comfortable, and highly effective treatments. The DioLase Plus has FDA Clearances for over 25 soft tissue procedures including the recently granted clearances for soft tissue curettage; removal of diseased, infected, inflamed and necrosed soft tissue within the periodontal pocket; and removal of highly inflamed edematous tissue affected by bacteria penetration of the pocket lining and junctional epithelium, and many other cosmetic and soft-tissue applications. Today, with the development of composite restorative materials and the public demand for better more conservative treatment options, the dental profession is seeing a resurgence of the air abrasion modality for cavity preparation. Crystal Mark has been at the forefront of all other air abrasion applications for the last 30 years. The most important attribute is the modality's capacity that allows for painless, anesthetic-free treatment of most incipient to moderate cavity preparations. Air abrasion also eliminates the noise, heat, smell and vibration of the dental handpiece. By doing away with anesthesia and the negative factors associated with the high speed handpiece, the dentist eliminates in one fell swoop the biggest stumbling blocks in access to dental care. All of these factors contribute to a win-win situation for the patient and the treatment team. The bonding of the restoration to the tooth structure negates the need to follow conventional G. V. Black cavity design parameters. This is well established in the literature. This is primarily due to the restorative material being "actively" bonded to the entire tooth structure as opposed to a restorative medium that is retained by way of gross mechanical retention (read that undercuts) such as is the case with G. V. Black, amalgam fillings. Furthermore, there is no minimal thickness of restorative material necessary in order to retain its structural integrity. You can remove only that tooth structure which is cariouslly involved and leave sound tooth structure untouched. The end result is the conservation of sound tooth, conservative cavity preparations and no structural damage to the underlying enamel/dentin. The dental profession finally has at its disposal the modality with which to provide the patient with the ultimate in conservative dentistry. DIFOTI® uses safe white light and takes advantage of recent advances in computer technology to bring dentistry into the twenty-first century. DIFOTI® is the only dental diagnostic imaging instrument of its kind to be approved by the FDA for the detection of incipient, frank and recurrent caries. It safely and instantly creates high-resolution digital images of occlusal, interproximal and smooth surfaces. It enables dentists to discover or confirm the presence of decay that cannot be seen radiographically, visually or through use of an explorer.